Many times an Assistant Manager is chosen from the current staff already working in an establishment who shows managerial qualities and skills. An assistant manager helps assist the restaurant manager in the operations of a restaurant. They are an important person because they perform in a similar capacity to the manager. In the absence of the manager, they are usually considered the "acting manager." In addition, they may be responsible for specific daily duties, such as interviewing new staff, hiring and firing, counting money, and being responsible for many important aspects of the business. They may also be expected to attend area workshops or staff development catered toward improvement of the overall business or operations. The Assistant Manager of a restaurant should be someone who knows both the restaurant business and public relations well and is able to balance many duties at once. They should be energetic and enjoy dealing with people. Ideally, they should have a strong background in restaurant work, preferably at many levels and in many different environments. Many times an Assistant Manager is chosen from the current staff already working in an establishment who shows managerial qualities and skills. For this reason, if you aspire to move into this position, it is important that you stand out as an excellent employee, no matter what position you are in. 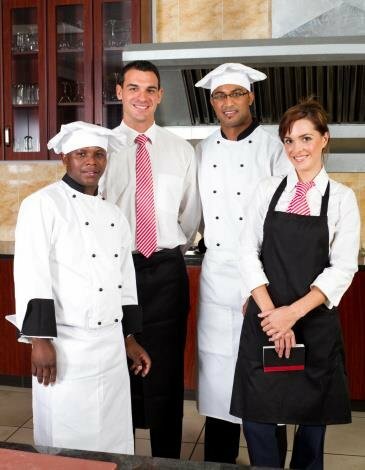 Typical education for an Assistant Manager would be training with a culinary arts school, a background in Hospitality fields, or similar disciplines. A certificate from an online school would be appropriate, if it included courses dealing with the restaurant business and public relations type skills. If someone did not have the educational background mentioned above, they could simply work in a number of established restaurants and build a reputation as an excellent employee. With time, they would likely be recognized as a good candidate for an Assistant Manager position. 1) Get a good education in the culinary arts, food services and/or hospitality fields. A manager or an assistant manager should have a diverse experience in food preparation, as well as diverse skills in dealing with people. They will be responsible for helping customers, settling disputes, and hiring and firing staff, as well as a variety of other responsibilities within the restaurant. So the more diverse their education, the better they will be at their jobs. 2) Get experience at restaurants in different roles. Many times, an assistant manager is chosen form the current staff already on hand at a restaurant. If you have experience at different levels and perform all of these with skill, upper management may opt to move you into the Assistant Manager position, when the opportunity arises. 3) Learn management skills. An assistant manager is a jack-of-all-trades in a restaurant and functions as a leader. So show yourself to be capable of leading others by being helpful, professional, and an expert at what you do. 4) Shadow the manager. Tell the manager you have an interest in becoming an assistant if the position arises, and ask to "shadow" or follow them through their day sometime. If they are willing, this is a good way to find out exactly what you’d be doing as a manager or assistant manager and help you focus on the skills necessary to do the job. 5) Talk to other assistant managers you know. Get to know people who serve in this capacity and ask them what they job is like. By talking to others in this position, you will get a feel for how it works and it will help you focus on the important skills you need. If you aspire to become an assistant manager, first, be great at what you do as a waiter/waitress, or any other position you are in. Let the management see your leadership potential, offer to be a shift manager or take on extra duties when you can. Start with a good education in the culinary arts and hospitality fields so your experience will be diverse and will fit the requirements of an assistant manager. If you enjoy helping people have a rewarding dining experience, I’m sure you’ll do great!